The study was conducted to assess the level of patient satisfaction and compliance with the services provided in family healthcare facilities. Patient satisfaction and subsequent compliance are legitimate and important measures for assessing the quality of healthcare services in order to make it more positive, satisfying, and meet patient expectations. A cross-sectional study was conducted between 1 April 2012 and 1 October 2012. Two sites, one urban and one rural, were selected by a multistage random sampling technique. The patients attending the selected sites during the period of the study were invited to fill an Arabic questionnaire to assess and evaluate patient satisfaction and compliance toward medical health services presented in family practice. The study showed that 63% of participants in rural areas were satisfied with services in the family unit and 37% prefer hospitals and private clinics, whereas in urban areas only 25% of participants seek medical advice in family healthcare centers. Patient satisfaction as a method of evaluating health services is essential and satisfaction with delivered services is important. Many factors affect compliance – for example, the patient, the disease, the regimen, the physician, and the healthcare system. Family medicine is the medical specialty that provides continuing and comprehensive healthcare for the individual and the family. It is the specialty that integrates biological, clinical, and behavioral sciences. The scope of family practice encompasses all ages, sexes, each organ system, and every disease entity . The family physician is the specialist trained to work in the front line of the healthcare system and to take the initial steps to provide care for any health problem(s) that the patient may have . The recent revival of interest in 'satisfaction' and disagreements over the meaningfulness of a unitary concept itself are outlined, and the various perspectives and definitions of the components of satisfaction are explored. The difficulties of developing a comprehensive conceptual model are considered . Satisfaction, like many other psychological concepts, is easy to understand but hard to define. The concept of satisfaction overlaps with similar themes such as happiness, contentment, and quality of life. Satisfaction is not a pre-existing phenomenon waiting to be measured, but a judgment people form over time as they reflect on their experience. A simple and practical definition of satisfaction would be the degree to which desired goals have been achieved. Patient/client satisfaction is an attitude – a person's general orientation toward a total experience of healthcare. Satisfaction comprises both cognitive and emotional facets and relates to previous experiences, expectations, and social networks . Satisfaction is achieved when the patient/client's perception of the quality of care and services that they receive in the healthcare setting is positive, satisfying, and meets their expectations. Compliance in family practice is defined as the extent or the degree of patient adherence to medical advice that is given by the physician. Grading of compliance is a relative process. Compliance to using drugs can be considered as good if the patient adheres strongly and takes his medication regularly. Adherence to lifestyle changes such as exercise and diet is one of the difficult types of compliance to evaluate. Overestimation of compliance is common among physicians despite many patients who are noncompliant of their doctor's advice. The study was conducted between 1 April 2012 and 1 October 2012. The participants attended the Quesna Family Health Center and Kafr Meet Serag Family Health Unit in Quesna district, Menoufia, during the working hours of 9:00 a.m. to 2:00 p.m. All participants gave their consent to participate in the study. No patient was repeated. Patients were ensured of the confidentiality of personal information. Has given verbal consent for participation in the study after being provided with the study details. Having any conflict of interest, such as working in the mentioned facility or being a relative to a staff member working in it. Data were analyzed using Microsoft Excel 2007 (Microsoft, Redmond, Washington, USA) and then exported to Microsoft word 2007 (Microsoft) to represent the data in graphic charts and tables. Two types of statistics, descriptive and comparative, were determined, where quantitative data were summarized as mean and SDs and qualitative data as percentages. Comparisons were made using the t-test for quantitative data and the χ2-test for qualitative data. The level of significance was at the 5% level . Quantitative data were expressed as mean and SD (X ± SD) and a comparison was made using the Student Z test. P value of 0.05 was considered significant. 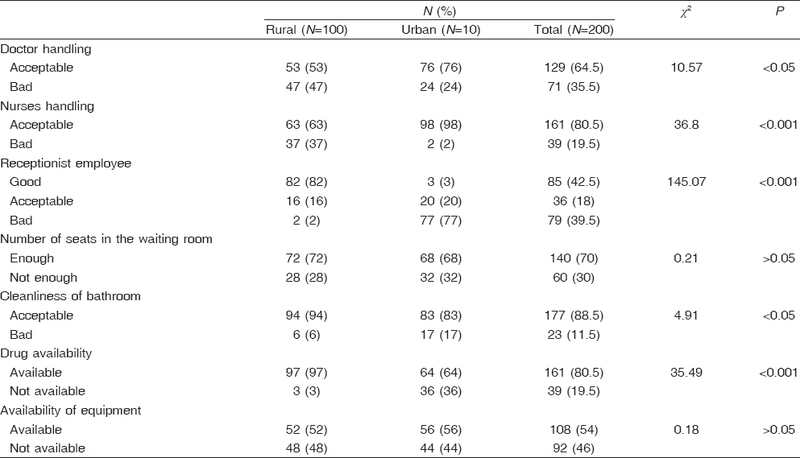 The study showed a nonsignificant difference between rural and urban areas as regards patient compliance to treatment [Table 1]. The study showed a highly significant difference between rural and urban participants (P < 0.001) with regard to most determinants of patient satisfaction [Table 2] and as regards barriers to follow-up visits (economic barriers) and difficulty in accessibility [Table 3]. The study also showed a significant difference between rural and urban participants (P < 0.03) as regards patient privacy [Table 4]. 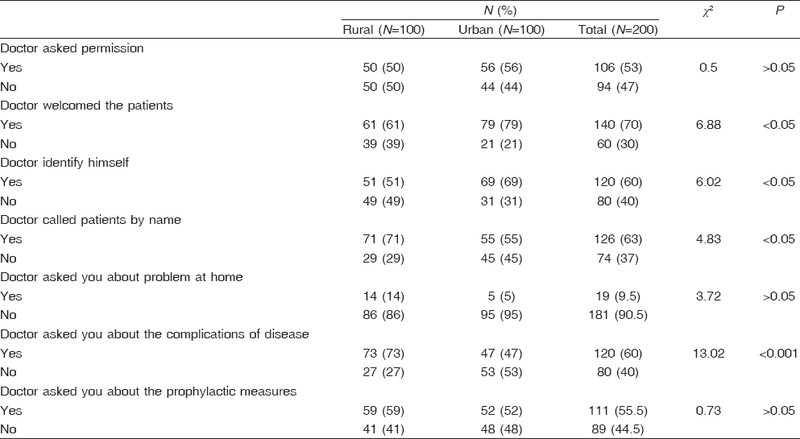 The study showed that 63% of participants in rural areas seek medical advice for primary health care at family health centers, whereas in urban areas about 25% of participants seek medical advice in family health centers [Figure 1] and [Table 5]). Figure 1: Difference between urban and rural as regards first choice for medical health services. The Joint Commission of Accreditation of Health Care Organizations has embraced patient/client satisfaction as a valid indicator and mandated in its 1994 standards for accreditation that 'the organization gathers, assesses, and takes appropriate action on information that relates to patient/client's satisfaction with service provided'. The population sample of this study consisted of 200 patients. The participants attended the Quesna Family Health Center located in Quesna El Menoufia and Kafr Meet Serag family health unit in Quesna El Menoufia between 1 April 2012 and 1 October 2012 during the working hours of 9:00 a.m. to 2:00 p.m. All participants gave consent for the study. The study reported that about 63% of patients in rural areas seek medical advice in primary healthcare at family healthcare units and 25% of patients prefer private clinics. In urban areas about 25% of patients seek medical advice in primary healthcare at family health centers and 30% prefer private clinics. These results were highly significantly different between rural and urban areas (P < 0.001). These results are in agreement with those of Wade et al. , who reported that about 59.3% of rural patients prefer primary care as the first choice for healthcare, compared with 53.2% in urban areas, showing the higher utilization of primary healthcare in rural than in urban groups. In contrast, a Greek study by Mariolis et al. reported that utilization of primary care by urban children is higher than that by rural children because of greater satisfaction with the services and shorter waiting time in the center compared with the unit. The study shows that there is a variable degree of satisfaction between urban and rural participants with regard to healthcare workers. It reported a statistically highly significant difference in patient satisfaction between rural and urban areas with respect to the behavior of the receptionist at the primary healthcare center (P < 0.001), whereas there was a statistically significant difference in participant satisfaction between urban and rural areas as regards interaction with doctors, and a highly statistically significant difference with respect to interaction with nurses. Two percent of participants in the rural group reported unsatisfactory (bad) interaction with the receptionist, whereas 82% reported satisfactory interaction (good). About 53% of total participants in rural areas reported satisfactory interaction with their doctor (good) compared with 47% who reported unsatisfactory (bad) interaction. Seventy-six percent of total participants in urban areas reported satisfactory interaction (good) with their doctor, compared with 24% who reported unsatisfactory (bad) interaction. Sixty-three percent of total participants in rural areas reported satisfactory interaction (good) with nurses compared with 98% in urban areas. These results are in agreement with those of the study by Steine et al. conducted in Norwegian primary care. The researchers used a questionnaire for measuring patient satisfaction with healthcare workers in urban and rural areas and reported that 60% of urban participants reported unsatisfactory interaction with healthcare workers, compared with 45% of rural participants. There was a statistically significant difference between urban and rural participants with respect to interaction with workers and a highly significant difference with respect to interaction with doctors (P < 0.001). In a study conducted in the UK by Mead et al. for assessment of general practice in urban and rural areas, 58.2% of rural participants rated the level of care and dealing with general practice as excellent, compared with 55.4% in urban areas. Fitzpatrick and Hopkins  studied patient satisfaction with primary health care in Bangladesh and reported that 64.7% of rural participants rated the interaction with doctors and healthcare workers as highly unsatisfactory (very bad), compared with 44.2% of urban participants. Our study showed a nonsignificant difference between rural and urban areas (P > 0.03) as regards patient compliance to treatment. A statistically significant difference (P < 0.03) was seen between urban and rural areas with respect to improper waiting rooms. Eighty-seven percent of urban participants reported being satisfied (good) with the waiting rooms, compared with 71% of rural participants. Sixty-seven percent of rural participants take less than 30 min to reach the family health unit and 33% take more than 30 min, compared with 78% of urban participants who take less than 30 min to reach the center. In contrast, a study by Lenardson et al. reported that rural residents were more likely to have difficulty accessing their usual source of care as rural residents are much more likely to have trouble reaching their usual source of care provider (37%), compared with urban groups (29%). Compliance with drug use can be considered good if the patient adheres strongly and takes his medication regularly. Adherence to lifestyle changes such as exercise and diet is one of the difficult types of compliance to evaluate. Overestimation of compliance is common among physicians despite many patients who are noncompliant to their doctor's advice. The study showed a nonsignificant difference between rural and urban areas as regards patient compliance to treatment. The study discusses the barriers for utilization of health services in urban and rural participants. [Table 3] shows a statistically highly significant (P< 0.001) difference between the two groups as regards the cost of service. Eighty-eight percent of rural parents believe that health service is expensive compared with 7% of urban participants. Evaluation of patient satisfaction should be a part of continuous improvement. Patient satisfaction, as a method of evaluating health services, is essential, and satisfaction with delivered services is important; focusing on it alone fails to address customer needs. Many factors affect compliance. However, it can be discussed under five headings: the patient, the disease, the regimen, the physician, and the healthcare system. Understanding the difference between customer needs and customer satisfaction is crucial to the organization's success in quality management. Family Physicians and Physician Assistants: Team Based Family Medicine. Available from: http://www.aafp.org/dam/AAFP/documents/practice_management/admin_staffing/AAFP-AAPAJtPaper.pdf. [Last accessed 2014 May]. Olesen F, Dickinson J, Hjortdahl P. General practice – time for a new definition. BMJ 2006: 320:354–357. Carr-Hill RA. The measurement of patient satisfaction. J Public Health Med 1992; 14:236–249. Keegan O, McDarby V, Tansey A, McGee H. Community involvement in A/E satisfaction survey. 2003. Available at: http://www.ukessays.com/essays/nursing/determining-the-degree-of-patient-satisfaction-nursing-essay.php?cref = 1. [Last accessed 2014 May]. Rosner B. Fundamentals of biostatistics. 3rd ed. Boston, USA: PWS-Kent; 1990. 115–117. Wade T, Line K, Huentelman T. School-based health centers (SBHC) evaluation project. A prescription for success. Health Foundation of Greater Cincinnati; 2005. Available at: http://www.healthfoundation.org/publications.html. [Last accessed on 2008 Jun 23]. Mariolis A, Merkouris B, Lionis C. Introducing general practice in urban Greece: focus on morbidity profile. Eur J Gen Pract 2004; 10 (3): 105–106. Steine S, Finset A, Laerum E. A new, brief questionnaire (PEQ) developed in primary health care for measuring patients' experience of interaction, emotion and consultation outcome. Fam Pract 2001, 18 (4): 410–418. Mead N, Bower P, Roland M. The General Practice Assessment Questionnaire (GPAQ) – development and psychometric characteristics. BMC Fam Pract 2008; 9:13. Fitzpatrick R, Hopkins A. Problems in the conceptual framework of patient satisfaction research: an empirical exploration. Sociol Health Illn 2000; 5:297–311. Lenardson J, Ziller E, Coburn, A, Anderson N. Profile of rural health insurance coverage: a chartbook. Portland, ME: University of Southern Maine, Muskie School of Public Service, Maine Rural Health Research Center; 2009.